Dream Clean is professional carpet cleaning company that operates in Islington. Share your cleaning needs with us and we will remove all dirt and allergens from your carpets. 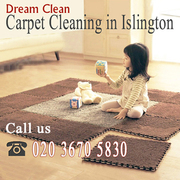 Get in touch with the best cleaning company on 020 3670 5830. Also, can visit our website for more specific information about our other services. Car boot sale ad details Carpet Cleaners Islington for sale in London. Carpet Cleaners Islington available on car boot sale in London. More Cleaning & vacuuming for sale in London and more second hand sale ads for free on 2lazy2boot - London car boot fairs - 33758.